Du Fu (712-770) - The other great poet of the Tang Dynasty (along with Li Bai), and considered one of the greatest in all of China's history. Between the two, it's impossible to say that one was better than the other, however, Du Fu's influence is probably more far-reaching. His poems are admired nearly as much in Japan as in China, and his work is more well-known among literary experts in the West. Unlike his friend, Li Bai who was a Taoist, Du Fu subscribed more to Confucian thought. Both were considered very generous, giving freely to those who were less fortunate. Du Fu's life was characterized by greater adversity than Li Bai's. Whereas Li Bai worked in the emperor's court for a time, Du Fu failed in his goal of becoming a civil servant because he was unable to pass the required test. Du Fu, being younger, experienced the turmoil that gripped China as the Tang Dynasty began to decline toward the end of Li Longji's reign. 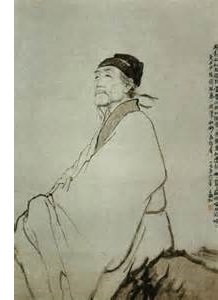 Li Bai, experienced some of this turmoil, but only at the very end of his life. And Du Fu suffered from a number of ailments that afflicted his body, one of them being asthma, making it difficult for him to breathe. This adversity is reflected in much of his poetry, which tends to be more melancholy than Li Bai's. It is also more autobiographical and much of what we know about his life comes from his poetry. This probably explains why his friend Li Bai is the subject of about a dozen of his poems, but he himself is the subject of only one of Li Bai's (of those which survive). He traveled, but due to his poor health, not as extensively as Li Bai. His health problems shortened his life and he died in 770. Some 1500 of his poems survive.